Though it's the year of "setsuden" or "energy saving," many places in Japan are still setting up their Christmas/Holiday light displays for their annual "illumination," or イルミネーション, as it's called in Japanese. Although I've noticed there haven't been as many listings so far this year compared with last year, but at least many that are putting up displays are going with LED lights (if they weren't already, since I think most probably were), which use less electricity. So while we should all do our best to continue saving energy this winter, and maybe not leave the Christmas lights on all the time, at least it's a way to feel festive and like it's actually the Christmas season (if you celebrate Christmas, that is). This can be difficult as an expat, I know, any holiday really, and maybe even more difficult if you have loved ones in another part of the world. So if the colorful, twinkly lights help put you in the Christmas spirit, here's a guide to finding holiday light displays in Japan. 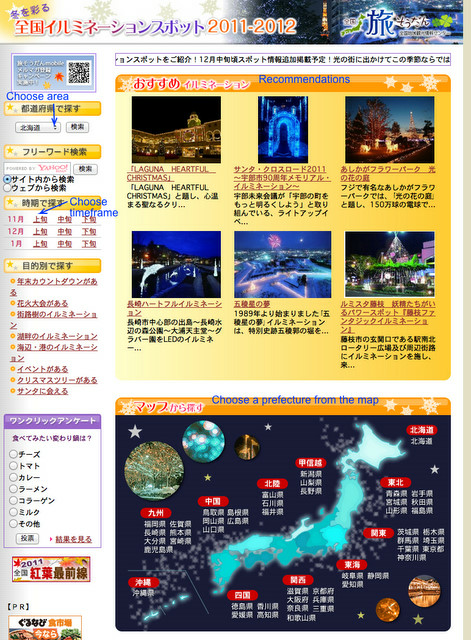 I've provided a walk-through of the Japan Travel & Tourism Association site below, but you may want to browse some of the others in case there are different (or more) options in your location. 1. Go to this page. You have a few options, such as checking out the recommendations in the large yellow box, choosing an area from the map below it, choosing from a specific time frame (November, December, January in this case) or choosing an area from the drop-down list on the top of the sidebar on the left. I'm going to choose Nagano (長野) from the drop-down list. 2. 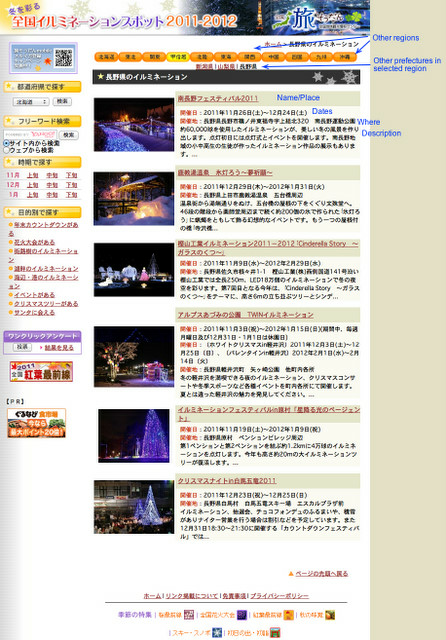 Next I'll see a list of illumination spots or events in Nagano. I can browse through the list and choose one that looks appealing or perhaps in or near the city I would want to go to. Alternatively, you could also choose a different region and/or prefecture from the horizontal list at the top. 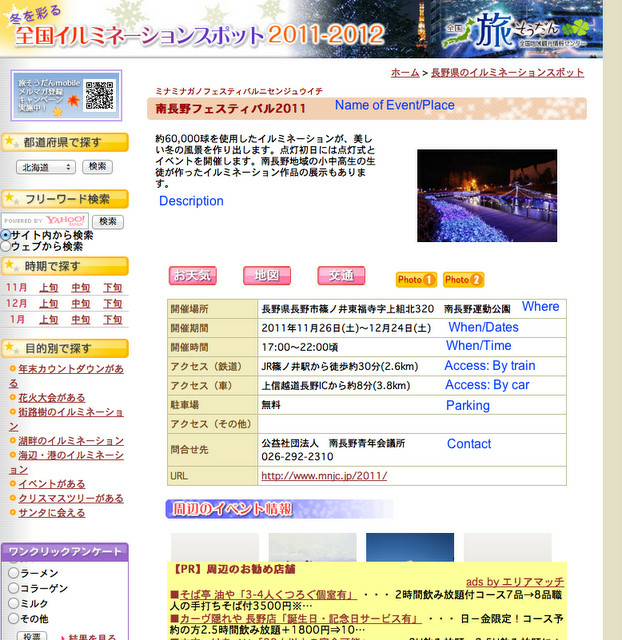 Each listing shows the name of the place or event, the dates, and where it's held along with a short description. I'm going to click on the first option. 3. On this page I can once again find the name of the event/place, a description, and detailed info about where, when and how to get there, plus a URL, if one exists. And that's it. These are typically some of the bigger places and events, so it's very possible there may be smaller displays or other places to go in your area. Yahoo also offers an Illumination app for iPhone and Android, called イルミネーション2011. Where is your favorite light display in Japan located? Any suggestions?